After graduating from Penn State in 2008, Kate played for the Philly Women but did not feel the same passion for the game that she did during college. Kate rediscovered her passion for the game when she began coaching for the North Philly Nomads, a high school boy's team. After finding the team through a Google search, Kate reached out to Larry Conlan, teacher who founded and coaches the Nomads. Kate told Larry about her rugby background and asked if he was looking for help. Larry immediately sent her the team's schedule, and Kate has been a member of the coaching staff ever since. Though terrified of coaching high school boys at first, Kate has "completely fallen back in love with the sport due to these kids"
The young team is kicking off their 3rd season in March. Coach Conlan founded the team because he saw rugby as an opportunity for at-risk inner-city kids to get involved and stay off the street. 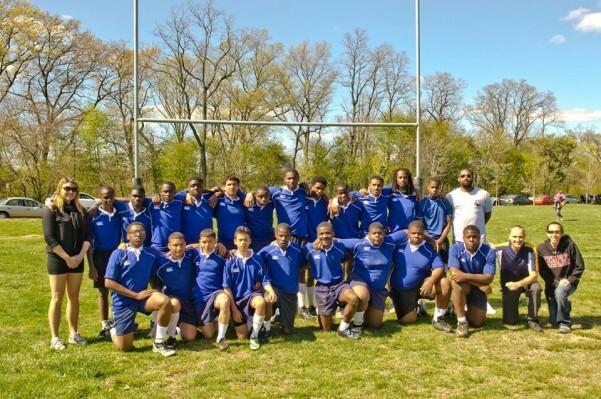 Rugby has also given the kids motivation to go college. With 2 seasons under their belt, the Nomads are excited to begin the season and are focused on improving on last season's record. Though other programs may have more players, experience, and resources, the Nomads have made it their goal to "never be out-worked." Their lack of matching warm-ups, nice facilities, and other resources enjoyed by their opponents does not dampen their spirits as the Nomads have embraced their role as an underdog. This season, the Nomads are also debuting a girls program, the Lady Nomad 7s team, which will help bring the sport to high school girls in the area and grow the Nomad's name. Overall, this spring should be a record setting one for a Philadelphia program that works for everything it gets. Check out this article about the team in The Philadelphia Inquirer. Follow the team and learn about their fundraisers here. Buy New PSU Rugby Merchandise - for Limited Time Only! PSU Rugby has teamed up with Kelly's Sports for different merchandise options. The items on the website will be the kit worn by the team this year and money from each purchase will go towards supporting the teams. You will only be able to order these items until June 1, 2015. Please Note: Orders will take several weeks to fill as the items are made to order. The individual orders will not be closed until after the entire "store" closes and will take a month or so beyond that to receive the items. The time until each "store" closes is listed in the top right corner of the website. For example, if an order is placed 1/29, it will not be processed until the store closes on 2/19, meaning you will likely not receive the items until a month after that (3/19).